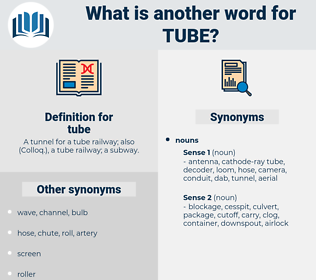 What is another word for tube? A tunnel for a tube railway; also ( Colloq. 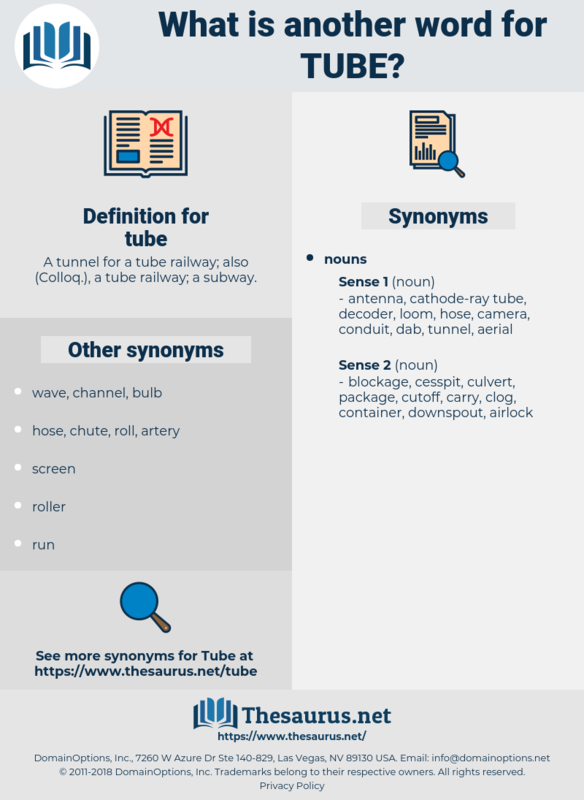 ), a tube railway; a subway. probe, tub, casing, socket, floater, tunnel, duct, driveline, float, barrel, tubule, tract.
" Yes," said Mr. Lavender, rather faintly, " the Tube Station." Having again filled the tiresome little pipe, she puts the silver tube to my lips with a bow. stem, blow tube, capillary, barrel, blowtube, silencer, drain, hosepipe, catheter, hose, torpedo tube, straw, test tube, cigarette holder, drinking straw, column, capillary tube, well point, speaking tube, pea shooter, tobacco pipe, stent, piping, inner tube, gun barrel, capillary tubing, chromatography column, cannula, wellpoint, pipage, syphon, siphon, coil, pipe, blowgun, mouthpiece, venturi, blowpipe. wrap, enwrap, enclose, enfold, envelop.